Every year the Gartner Institute publishes its annual predictions for new technologies. It highlights the trends to consider for future manufacturing processes and products. 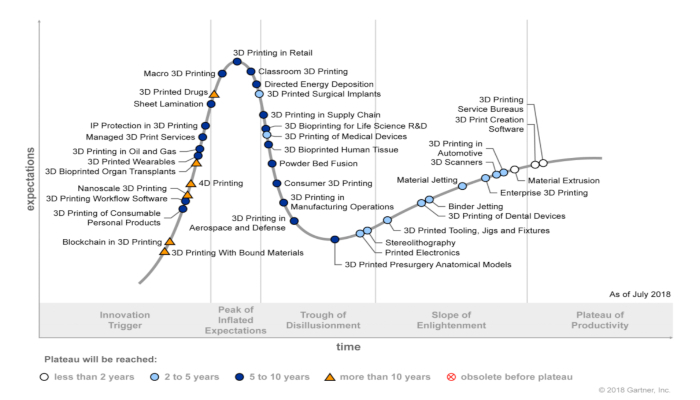 In mid-December, they published their Gartner Hype Cycle showcasing their 3D printing predictions for 2019. What is the Gartner Hype Cycle? First, it is important to explain the Gartner curve, also referred to as the Gartner Hype Cycle. We can see that the first phase of the Gartner Hype Cycle is a phase of growing enthusiasm and rising expectations for the technology in question. Indeed, users of the technology are confident it will open new opportunities and has a lot to offer. Once these expectations reach a peak, consumers realise that the technology will be harder than expected to implement. Therefore, their enthusiasm for it starts to plummet. Finally, the curve will reach its second wave of growth. As investments and developments are made expectations start to rise more gradually once again until reaching a plateau. 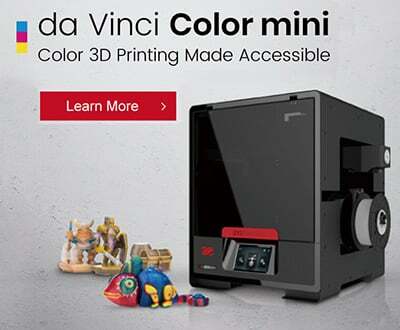 Whilst 3D printing is expected to continue its growth, 4D printing has recently entered the market and is in the first phase of the Hype Cycle. 4D printing has the potential of offering dynamic capabilities. It is currently being researched and developed by universities and some companies such as Airbus, Autodesk, HP and Stratasys. Soon enough 4D printing will have to face computer, scientific and engineering hurdles. It is expected to only reach its plateau in about ten years. The Gartner report predicts that by 2023, startup companies working to commercialise 4D printing will attract $300 million in venture capital. We’ve seen throughout 2018 the medical sector make growing use of additive manufacturing. By 2023, 25% of medical devices in developed markets will make use of 3D printing in Gartner’s prediction. This prediction is concerned with the shift towards the use of 3D printing for pre-surgical planning and in performing joint replacement, surgical implants and prosthetics. However, some obstacles are very likely to arise such as ethical debates and regulations. Still within the medical field, the third prediction is that by 2023, 3D printing using biosynthetics and living cells will drive a multibillion-dollar prosthetic and organ ‘patch’ and replacement market. Metal 3D printing is on the rise in 2019. By 2020, 3D printed metals and alloys will become a critical element in supply chains for replacement parts in commercial, military and even some consumer markets according to the report. Let us know what you think about this article in a comment below or on our Facebook and Twitter pages! Don’t forget to sign up for our free weekly Newsletter, with all the latest news in 3D printing delivered straight to your inbox!